HomeRace ReportsA record year for the nineteenth! The twenty-eighteen Imana Wild Ride will go down as a year for the records. At the business end of the racing field, the stage records fell every day. Not by a minute or two but by minutes a plenty. This resulted in the top three teams all clocking accumulated times well under the previous record time of nine hours and one minute. Leading home the charge for victory was none other than defending champion Warren Price and partner Andrew Hill (Safire / TIB) who stopped the clock in an unbelievable accumulated time of eight hours, seven minutes and 19 seconds for the four days of racing. Price, formerly a top-level marathon paddler, swopped his paddles for pedals some years back and has left his mark on the Imana Wild Ride, claiming his seventh successive title and in a record time which will undoubtedly stand for many years. Having partnered with Andrew Hill the previous year, the pair once again proved an indomitable force and set a cracking pace over the four days of rugged and testing riding along the pristine coastline. Aside from favourable tail winds on the first two days, they were kept under pressure by Stellenbosch student Damon Stamp and experienced (former pro) cyclist Darren Lill from Cape Town, who were in hot pursuit. Stamp and Lill (St-iLL Wild Riding) kept the pressure on the leaders throughout the race, taking the stage win on day three – which left them with a twenty-six second deficit on Price & Hill at the start of the fourth stage. There is far more to the Imana Wild Ride than simply riding a marked course as fast as possible. The route is un-marked and riders need to know the route intricately in order to navigate it efficiently. There are some big rivers to cross, some of which require ferries. Not to mention some surprisingly steep hills to traverse, which may reduce even the racing teams to a walk. The fourth day contains three rivers with ferry crossings and whilst the organisers make every attempt to allow riders efficient crossings, this is not always feasible when dealing with limited resources in very rural areas. Sadly, for Stamp & Lill, the second ferry at Mtakagie became their nemesis after Price and Hill gained critical time on them leading up to this river crossing, which gave the leaders the advantage of taking the ferry ahead of their pursuers and the subsequent delays left the pair frustrated as their target disappeared over the hills whilst they waited to cross. In the end, a well-deserved victory went to Price and Hill with Stamp and Lill in second and Cape Town’s Craig Woods and Oli Munnik (Skullet) riding a consistent race to place a solid third. Whilst records fell at the front of the race, even bigger records fell at the heart of the race. The Imana Wild Ride is all about giving back and making a difference. Nineteen years in operation and with a proud legacy of forty classrooms built to date is something of a testimony to those who participate in the Imana Wild Ride. Combined fund-raising efforts this season have accumulated a staggering amount of just over one million Rand, largely thanks to the generosity of a handful of participants and private donors. Since 2006, when the first classrooms were built by the Wild Ride Education Company, the Imana Wild Ride has made a difference to thousands of school children who may otherwise not have been able to progress with their education. 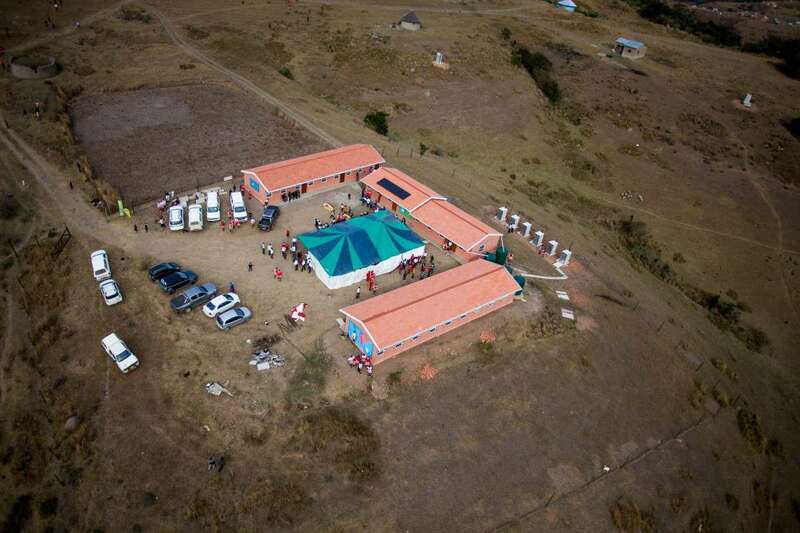 This year saw the completion of the Bulungula College in the Xhora Mouth District – a complete high school facility which was started in 2017 with the third phase added this year. In his address to the participants at the finals awards evenings, Mr Justice Nkumishe (Key Accounts Director at Imana Foods), used the analogy of a parent whose child has progressed from pre-school, through primary and secondary schools; the Imana Wild Ride is now seeing the fruits of their child ready to embark on tertiary education. 2019 will see the twentieth edition of the ‘racing of the tide’; a celebration of an event which began at the turn of the millennium and has touched the lives of many during it’s ‘double decade’ looks set to leave indelible trails in the changing sands of the future.